Find My Workspace lists over 95% of the business centres market in Newbury. Simply click Request Quote to check pricing for one office, or Add to Basket for multiple offices. This beautiful business centre provides affordable office space in an attractive Grade II listed building in the town centre just two minutes from the railway station. The rental fee is a monthly inclusive price that covers all the essentials such as rates and utilities, which allows you to accurately forecast and manage your cashflow. 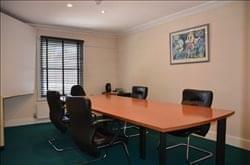 This centre will look after your office while you focus your time and resources on expanding your business.